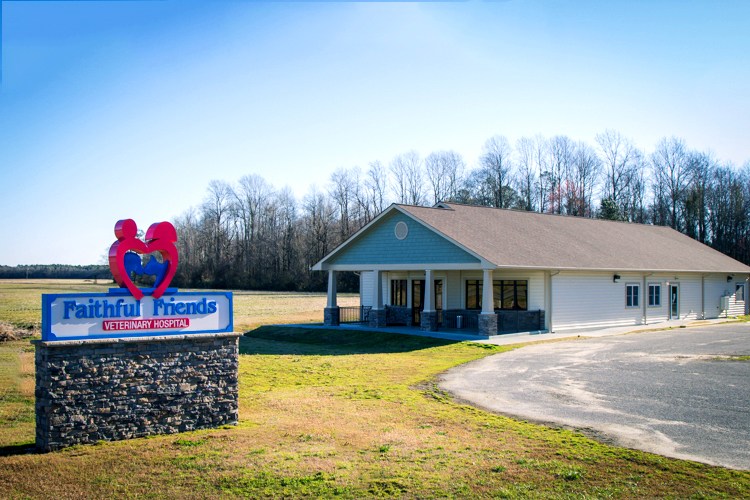 Faithful Friends Veterinary Hospital | Grifton, NC 28530 – We offer hopen when no one else can or has. Pets receiving regular care for their teeth by a veterinarian and at home can increase their life expectancy by as much as 25%. Scratching that causes wounds or hair loss may be a result of an allergic condition. Let our caring staff diagnose & provide relief for your pet. One of the most important diagnostic is an x-ray system. We are pleased to offer the latest in radiography with our digital x-ray unit. We will determine whether your pet is heartworm positive or negative. Treatment options or monthly preventative medicines are available. Faithful Friends Veterinary Hospital has a goal to keep suffering and pain to an absolute minimum while maintaining your pet’s quality of life. Similar to “allergy shots” administered to people, these injections help your pet develop a tolerance against whatever has been causing the allergic reactions. Our diagnostic capabilities, as well as experience and compassion, make our hospital an excellent choice for the life of your animal companion. Here at Faithful Friends Veterinary Hospital, we have a surgical and monitoring facility that includes state-of-the-art equipment and analyzers. Dr. Heath understands the benefits of this drug and pain-free instrument, and is pleased to offer laser therapy at Faithful Friends Animal Hospital. We recommend a permanent form of identification known as a microchip to increase the odds of being reunited with a lost pet. Proper nutrition is one of the cornerstones of your pet’s health. One size does not fit all when it comes to a proper diet for your furry family member! If your pet is facing a painful condition or surgery, contact us today and let us keep your pet as comfortable and pain-free as possible. Faithful Friends Veterinary Hospital has a complete pharmacy at our facility for the health of your pet, as well as your convenience. We offer rehabilitation services for pets that have experienced trauma, major surgery, or disease that may have caused pain or limited movement. When your pet is in need of surgery ranging from spay and neuters to intricate orthopedic procedures, you can count on our caring team. Dr. Ivy Heath and her staff will be there for you and your pet from the time they are young, as well as through their later years. Welcome to Faithful Friends Veterinary Hospital! Faithful Friends Veterinary Hospital is a small town clinic, doing upscale things! Dr. Heath is a leading example of how the bond between humans and animals should be demonstrated! Schedule an appointment for your pet to meet Dr. Heath and her staff! By combining exceptional veterinary medicine with compassionate care, we will maximize each pet’s quality of life, while enriching the lives of their owners. At Faithful Friends Veterinary Hospital, we strive with every patient to offer HOPE, even when no one else has. Faithful Friends Veterinary Hospital will be a sought-after veterinary practice where distance and cost are not primary considerations for care because we have effectively marketed our strengths, seen to completion implemented plans of action so that a consistent message is given to our clients, and we have taught effective communication to team members so that feeling based banter (gossip) can cease, and we will be accountable in finances, consistency, and providing a valued product by monthly reviews, goal-based staff meetings, and constantly revisiting our pathway plan. Faithful Friends Veterinary Hospital will prosper because team members will be excited to come to work and make a positive difference in someone’s life. Our clients are friends as well as customers, and we value their continued trust and goodwill. Courtesy and patience with clients and their pets are our priorities. An attitude of “We are glad you are here” must be conveyed to each and every client. Clients favor us by selecting us to care for their pets, and not vice versa. This is probably the most important concept for you to remember, and makes it easier to understand the importance of showing genuine concern and interest in a client’s problem. Integrity and ethics are two things we never compromise, ever. Please make sure you keep this in the forefront of your mind when working at and representing Faithful Friends Veterinary Hospital in the general public. Contact us to schedule an appointment for your pet today! no one else can or has.